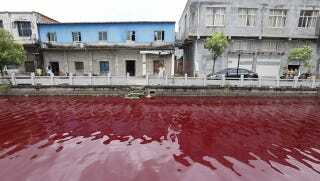 What Turned This River in China into a Blood-Red Mess? People in Wenzhou, a prefecture in the Zhejiang province, woke up yesterday to discover that their local river had turned a dark crimson. What could have caused the sudden transformation? The river was an ordinary color the night before. By today, it had returned basically to normal. But the environmental department was taking samples and analyzing them. An early analysis of water samples suggests illegal dumping as a possible cause for the transformation. "We suspect that somebody dumped artificial coloring in the water because he thought the typhoon yesterday would cause heavy rain, and nobody would notice [the color]," bureau chief Jianfeng Xiao, told China News. "It turned out there wasn't heavy rainfall yesterday, so the evidence is left behind." According to Jennifer Hui at Shanghaist, the dominant theory remains that it was dye. Especially because this scenario resembles a similar incident two years ago on the Yangzee River, which was briefly turned to the color of blood by people from dye workshops dumping waste into the water illegally.